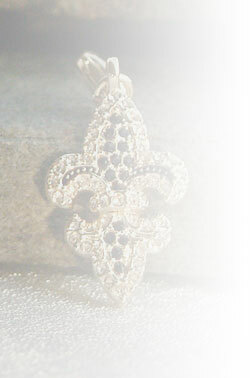 Go Sports Jewelry gifts for sports, teams & fleur de lis jewelry, charms, pendants, necklaces, bracelets and earrings featuring custom designs. You've never seen window bling like this! 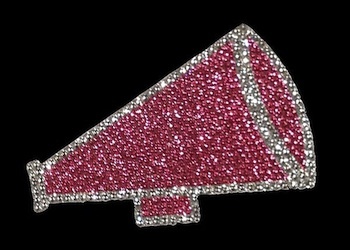 These are specially made & trademarked with color coordinated glitter behind the rhinestones for EXTRA BLING! These are amazing, you have no idea until you see them in person! ALL other rhinestone stickers are merely stones stuck to a clear background, NOT these! 3.75"x 5.75" diameter Cheer Megaphone Window Sticker! Choose Clear, Light Pink or Hot Pink. Bling for your car, show your pride. *Clean the exterior window surface with soapy warm water. Once dry, apply sticker to exterior window surface pressing down on one side, tap the middle and press down the other edge until air bubbles are worked out. Some air bubbles may remain but will vanish or shrink with the sun and heat.